TechPowerUp came across some photos of Gigabyte's new GeForce GTX 670 WindForce 2X. This new card features a compact non-reference design, with Gigabyte's Ultra Durable VGA component selection and its WindForce 2X cooler. The card features 4+2 phase VRM power for the GK104 GPU and uses two 6-pin PCIe power connectors. The card ships in two variants, one that sticks to NVIDIA-reference clock speeds, and an OC variant (941 MHz core, 1019 MHz GPU Boost, 6.00 GHz memory). The cooler uses a compound heatsink. Its design consists of a main central aluminum heatsink which draws heat from the GPU, while two satellite aluminum fin heatsinks draw heat from the GPU through two 8 mm-thick copper heat pipes. The heatsink is ventilated by a pair of 100 mm fans, which spin at low speeds and claim low noise levels. 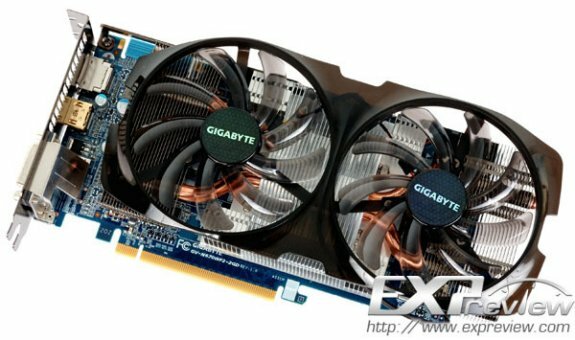 Gigabyte's WindForce 2X graphics card is expected to cost less than its flagship WindForce 3X.